Sunday August 19, 2018 - President Uhuru Kenyatta met privately with Ethics and Anti-Corruption (EACC) officials at State House, Nairobi. The meeting comes hot on the heels of the ongoing purge on corruption, coupled with arrests of high profile figures implicated in graft. 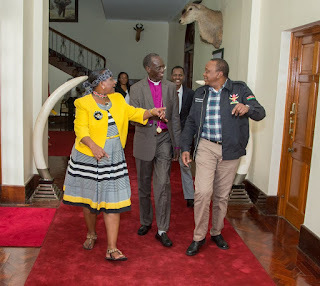 The EACC led by its Chairman Archbishop Eliud Wabukala and CEO Harakhe Waqo, briefed the President on the progress in the fight against corruption and assured him that they are now going for the big fish as they call them. On his part, Uhuru assured them of his full support and urged them to step up the good fight against corruption and stump out the vice from the country. He also advised them to work closely with the Directorate of Criminal Investigations and Director of Public Prosecution (DPP), Noordin Haji, to make sure they execute the cases to their logical conclusion that include conviction of those found guilty and recovery of stolen money and assets. He also warned the commissioners to ensure they don’t compete with other agencies’ mandated to fight corruption in the country.